My favourite holiday, even though it’s not mine, and it’s not actually a holiday for me. Thanksgiving. I am thankful. There is no turkey for me today. I have been to work, not sat at home. But I have spent the day feeling thankful. For my family, in all its chaotic glory. For my friends, both near and far, and the fact that they think of me, and me of them, with love. For my job – no matter the complaints, I am lucky enough to have a job that I chose, that pays me nicely, that makes me feel like I have a value and can offer something to the wider world. And for the fact that I had the chance to live and work in the US, where this holiday has it right. No presents. Just food, and friends and family, and a small ‘stop’ before the chaos of Christmas abounds. So, for my biggest pickle, the American, I am thankful. It is a good, big world, to explore and enjoy. Thanksgiving – my favourite (non) holiday. It was always going to happen. The question was only ever when, and how hard. But it’s happened. Falling over that is. And the good thing is, it happened and I’ve made it out the other side. And I’m still leaning in. Just slightly less extremely. There was Dubai, and the long hours. Followed by the day of meetings. And th Friday where Hubby did need to work, so I worked too. And I cleared a load of things. But I felt like a mug. And I started to question whether my 90% contract was ever going to work, as I still had so much more to do. I have consistently worked more than my contracted hours. Consistently worked more hours than full time hours. But now, I am only getting paid for 90%. So I started to seeth a little, and then I started to get ill. And that combo doesn’t work so well. So by Monday I was telling my bosses that it would just be easier all round if I worked full time again. And then I went home sick, begged the children to be good for me while I bathed them and put them to bed. And went to bed at 730. I ached, from the top of my head to the tips of my toes. It had all, officially, become too much. A day off work, but still working from bed. A return to the office, and a return of various team members who can help. A moaning about life dinner out with my best mate. More social stuff in a week than I normally manage in a month. A long discussion with hubby as to what it was I really wanted in my life. And a slowing down. It was the slowing down that mattered most. It was the slowing down that helped the most. I built Lego fire stations with my boy. I played peekaboo with the littlest pickle. I talked about Killer whales with the biggest pickle. And I sat there on Sunday night, and I emailed my bosses and asked for help. Explained that actually, I did still want my 90% deal, as I did want the time. For me. For my family. But that the current situation with workload was not working for me. And that I would appreciate their help in working through it. In all honesty, nothing has changed. There have been no conversations. I have been busy at work, away again on a recce, and facing a crazy day of meetings again tomorrow when I’m back in the office. But, I have decided. For now, I have decided that I am not falling over again. I am going to carry on leaning in, but look for some support to help keep me upright. Being a martyr helps no one. I will try to learn to say ‘no’. I will remember to stop and breathe. And eat chicken pot pie with my husband. Because, I cannot do everything. And even if I could, no one would thank me for it. Has unsurprisingly led to the not so joyful state of being back in the office, tired after the long hours and jet lag, with a day full of meetings about a myriad of projects that now all urgently need attention and I feel like I can’t breathe under the weight of the pressure. What can be delayed? Dropped? Apologised for? Who will it be best to upset and offend? As there is no way that I can do everything now required in the time available to me. My nine days out of ten is working against me, tempting me with time off and disconnection, while taunting me with all I will fail against. Or do I do (some) work – and p*ss the Husband off who was going to take the day off to spend with me, seeing as we’ve only seen each other for 1 night in the past 12 days, and he goes away again for the week on Sunday morning? And I can’t even start to explain the pickle situation. I was too late home for them last night, just kissing their sleep ridden, sweaty heads when I got in, then rushing them out the door to school / nursery this morning… Only to not make it home in time to see them tonight due to meetings etc… I know I’m lucky that Daddio has been doing the looking after, and there has somehow always managed to be one of us to put them to bed, but this was not the plan when I had them. Then, the only thing that has taken the backseat is the marriage… Yet somehow that probably scares me the most. As without an investment in the foundations of my life, how can I be really sure that all is as solid as it needs to be? It might be thought of as weird, but sat here, at midnight thirty, in the World Trade Centre in Dubai, I have kind of come back across the joy of working. I’m not often this far from home. I couldn’t tell you the last time I took a long flight on my own. Or when I last felt quite so much like part of a (great) team. It’s been challenging, and crazy, and feet achingly sore, but amongst the exhaustion, and the (mild and not so mild) panic, there has been laughter. The ability to just think about the team, the project, the work (and not the commute, and the rush, and the everything). All the time has been here and available to support the now, the right this minute, the here – and that is so rare in my normal day to day. And at the end of the day, when bed has long been calling, it’s been so fun, so unusual, to just be able to go ‘f*ck it’ and have a drink instead with the team. Knowing that I can deal with the exhaustion on the flight on the way home. And it’s been a good job. I’m proud of the team. And that, in truth, is the joy in working. It’s been a crazy week with hubby away. With roadworks and rain and an unbelievable amount of ‘can you just…’ work, and I feel as if I have just raced from one thing to the next, in order to get them done, tick them off – and get on to the next thing. This is often the way when hubby is away. It’s nothing new. But it feels like a waste. Yes, I get to work later than normal – but I need to chill. Lunch is non existant as there’s just too much to do. The 4 o’clock departure time looms, and the reverse commute is just as manic, but filled with darkness, rain and more damned traffic jams. The whole world seems to want to go in the same direction as me, as there is just not enough road space. I don’t want to miss everything. I don’t want to look back and wonder quite what I was hurrying along for. Because the truth is, I’m hurrying along for this. This is my life. Each and every day. So, in the future, I hope to remind myself that I’ll always be busy. It will never stop. But I chose this. And I need to choose the moments. To be there. I need to stop, and stand and stare. At all the wonderful things that my days contain. 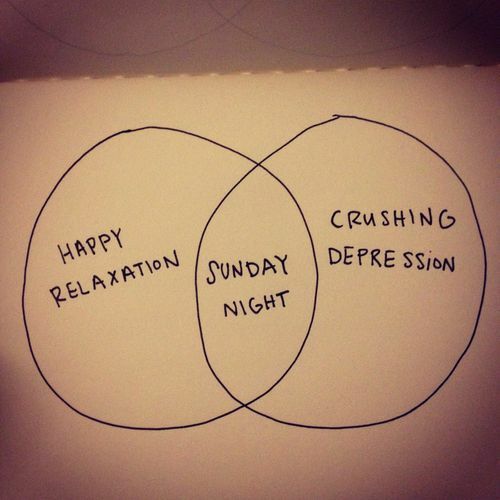 Sunday Night Blues – such a waste of an evening, but such an every week occurence. Hubby’s away again, but slightly later than planned, so the day with the 3 pickles was more fun than anticipated – everyone likes to look for aeroplanes! So, what do I do now? With tomorrow off, thanks to an Inset Day, I’ve managed to waste a good chunk of time clearing work emails – in a vain attempt to keep on top of things, and now I need to tidy up, put the Ocado away, sort the laundry, get over the fact that I ate a plate of (super tasty) chips earlier, and do something, anything, that can turn this evening around and make it feel worthwhile. I’m more likely to eat chocolate and drink the end of the red wine. There’s always tomorrow to be better, yes? One day, I swear I’m going to crack the Sunday Night Blues, I just don’t think it’s going to be today.